Public trust in government’s ability to solve major problems remains near a historic low, according to a new national poll by the Pew Research Center. 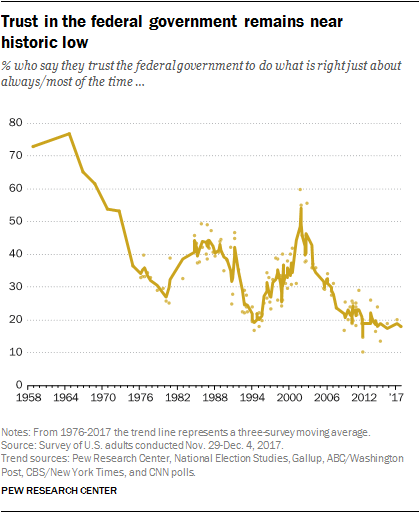 Only 18 percent of 1,500 respondents nationwide in late November and early December said they trust the federal government to do the right thing “just about always” or “most of the time,” a share that has remained steady for more than a decade. 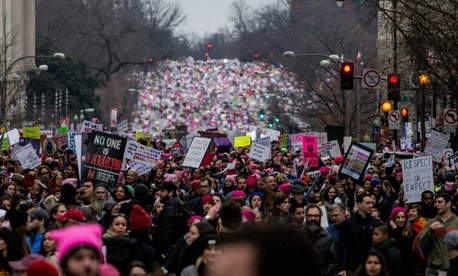 What is new in the Trump era is a rise in anger at government among Democrats, some 29 percent of whom expressed anger, compared with only 19 percent of Republicans. Overall, the percentage of Americans who expressed anger at the federal government reached a high point (30 percent) during the October 2013 government shutdown, Pew noted. Among Republicans, as many as 33 percent said they were angry at government at times during the Obama administration. Still, the share of Republicans expressing anger at the government is higher today than during the first six years of George W. Bush’s presidency, when it was less than 9 percent. And more Republicans say they trust the government today than did so during the Obama administration—just 22 percent of Republicans, versus 15 percent of Democrats. Larger groups of respondents—well over half—say they are “frustrated” with government. Since Pew’s last such survey in 2015, “opinions about the federal government’s handling of several major issues have become less positive and much more partisan,” Pew said, citing issues ranging from providing healthcare, alleviating poverty, responding to disasters and handling terrorism and the economy. Substantial majorities—as high as two-thirds—say government should play a “major role” in such issues. But agency performance has not met the public’s expectations. Positive ratings for the government’s handling of ensuring access to health care have declined 20 percentage points since 2015; today, just 36 percent say it does a very or somewhat good job in ensuring access to health care, down from 56 percent two years ago, Pew said. Analysts pointed to 15-point declines in positive evaluations of performance in protecting the environment and responding to natural disasters. “There is no issue, among 12 tested, on which the government’s performance ratings have improved significantly,” the report said. While 80 percent of the public says the government should play a major role in managing the country’s immigration system, just 32 percent say it’s doing a good job in this area. Two-thirds think the government should be involved in helping people get out of poverty, but only 26 percent rate the government positively there—the lowest rating for any issue. While wide majorities say the government should be involved in ensuring a basic income for those 65 and older (71 percent), access to health care (69 percent), access to high equality education (68 percent) and helping people get out of poverty (67 percent), fewer than half say the government is doing a good job in these areas, Pew reported.